There is a lot of love for semi-auto pistols nowadays, but it is hard to beat the reliability, power and clean manufacturing of a revolver. 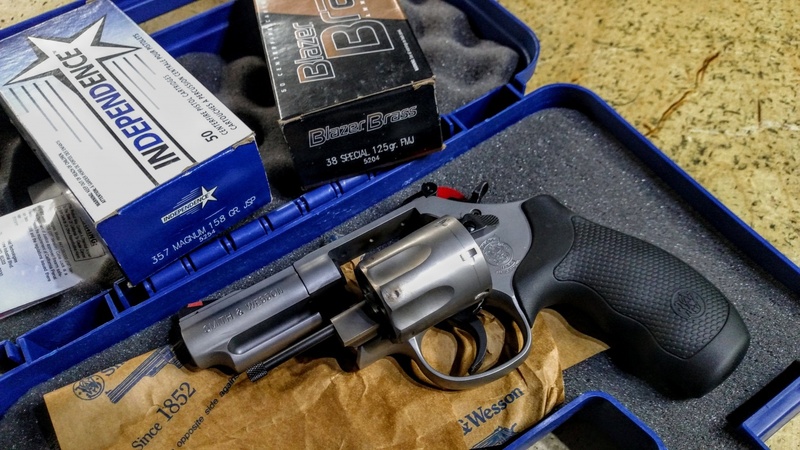 In this TFB Review, we take a look at the stout Smith & Wesson Model 66 Combat Magnum® .357 Magnum with a 2 3/4″ barrel. The Smith & Wesson Model 66 comes in two different configurations of barrel lengths from the factory. Consumers can either choose a 4.25″ or a 2.75″ barrel option. The specific variation of the Model 66 that we took to the range is the 2.75″ option. The MSRP of the Smith & Wesson Model 66 Combat Magnum® .357 Magnum is $849. The Model 66 is a K-frame revolver by Smith & Wesson. The K-frame was originally introduced in 1899 specifically for the .38 S&W Special cartridge. 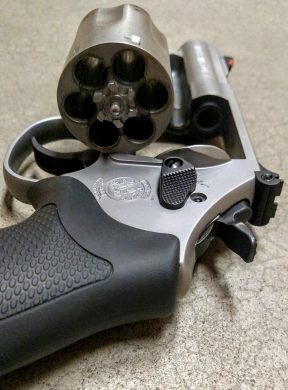 So to see the Model 66 in a K-frame size as a .357 Magnum is pretty unique even if the outward appearance is pretty unassuming. It also boasts a 2-piece barrel, a full-length extractor rod, and a ball-detent lock-up mechanism. Overall, the Smith & Wesson Model 66 Combat Magnum® .357 Magnum is very close in size to a Smith & Wesson Model 686. 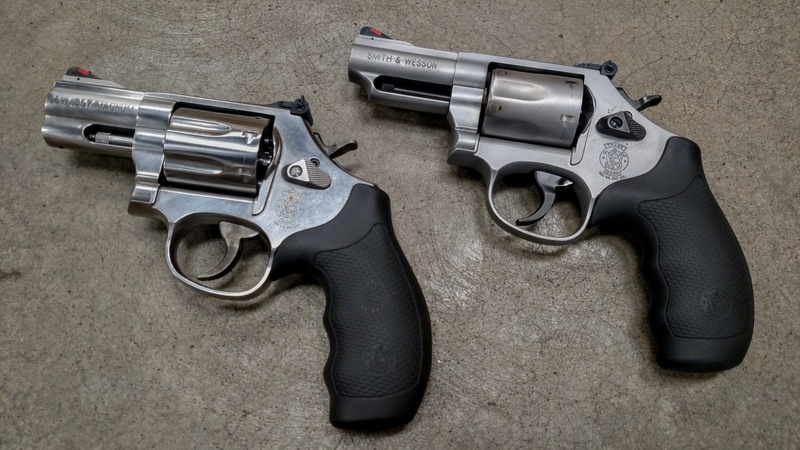 Most people should appreciate the leaner K-frame of the Model 66 versus the beefier L-frame of the Model 686 if you are contemplating purchasing a shorter barrel length like this revolver we reviewed. Unboxing the revolver at the range, it comes with your standard issue of contents. You receive an owner’s manual, cable lock, red chamber flag (plastic disc to set on the cylinder facing when closed) and a key set for the internal lock. From the factory it comes clean and dry; not excessively oiled or lubed. To get a good feel for this revolver, both .38 Special and .357 Magnum target rounds were fired. The .38 Special rounds were very enjoyable, controllable and light to shoot. The .357 Magnum rounds were still controllable but had a lot more snap. The snap was not surprising, but the fact that it was easily controllable with the moderate-sized handle was a pleasant surprise. The power of the .357 Magnum cartridge hit your hand hard, but the dexterity from the rubber grip and its length helped control it. The single-action trigger pull of the Model 66 was very light and crisp. The break of the trigger was definitive and clean. Even with the shorter 2.75″ barrel, essentially anywhere I aimed I was hitting that mark perfectly. The double-action trigger pull was consistently heavy from the initial pull up until the break of the trigger. So while it was heavy, there was no feeling of stacking or a compounding resistance that would make you squirm wondering when the double-action trigger may finally fire. The break of the double-action trigger pull, just like the single-action, was definitive and smooth. 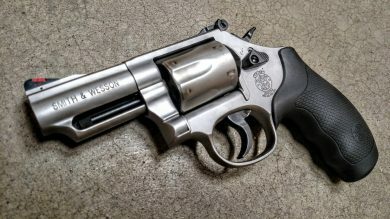 After methodically firing 100 rounds (50 rounds of .38 SPL and 50 rounds of .357 Mag), I gained a few other impressions and thoughts about the Smith & Wesson Model 66 Combat Magnum® .357 Magnum. 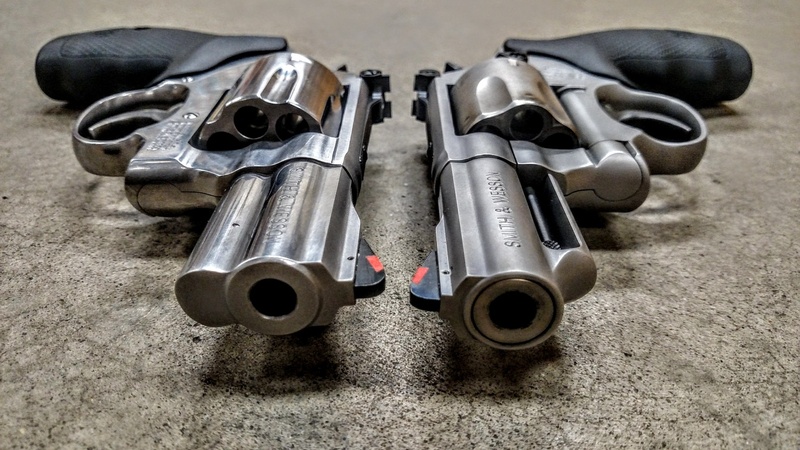 After all of the firing stopped and the earmuffs came off I had a few more thoughts about the Smith & Wesson Model 66 Combat Magnum® .357 Magnum revolver. For one, I would have liked to have seen the rear sight have a white outline of some kind. I hail from MN so this range day was conducted indoors and most indoor ranges (ironically enough) have really poor lighting in the shooter’s bay, but phenomenal lighting out by your target. As a result, even with young eyes, you have to work to drop that red ramp front sight exactly where you need it to be. The Smith & Wesson Model 686, by comparison, comes with a white outline rear sight standard. 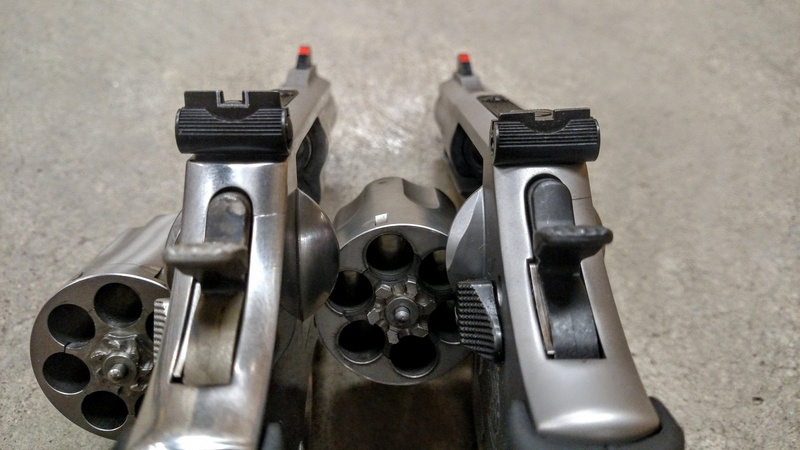 I would believe these sights should transfer over easily enough and I would like to see those on the Model 66 as well. I view the Smith & Wesson Model 686 as a benchmark of features and quality for revolvers chambered in .357 Magnum. So a lot of the comparisons I make will treat that as the yardstick. A 2nd item that differs from the Model 66 in comparison to a lot of the other revolvers Smith & Wesson puts out is the black accents. 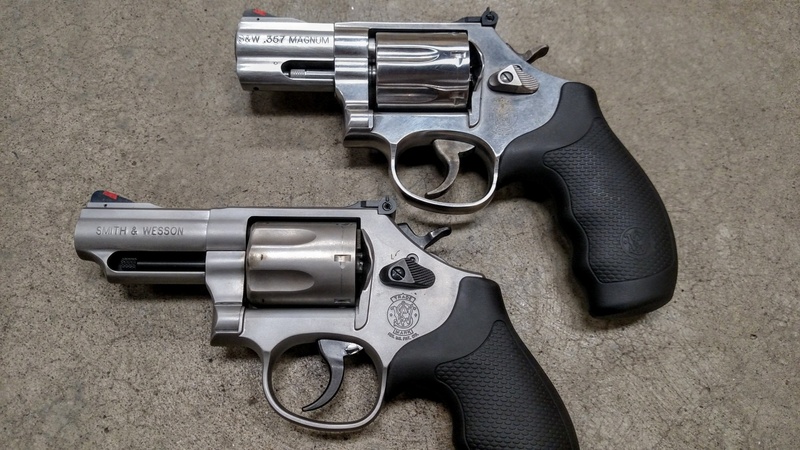 On most Smith & Wesson revolvers the trigger, hammer, cylinder release and potentially other small pieces will be case-colored; that swirled look of almost running water on metal. It can be very beautiful when done well, but I thought the black accented features on the Model 66 was a refreshing change from what has become standard protocol for Smith & Wesson. As you can see above, on the Model 66 the extractor rod, cylinder release, trigger, and hammer are all accented black. They appear more pronounced in a profile image like this and better match the black grips. In comparison to the Model 686, the case-colored pieces get almost washed-out when paired with a brushed stainless finish and are not as easily noticed or appreciated. Another attribute of the Model 66 I liked was the satin stainless finish. You might be thinking that is not a big deal, but let me explain. Once again, a standard Model 686 provides a brushed stainless finish. Often times, you can see actual brush marks on a brushed stainless finish leading the user to almost believe a new revolver is… used. The satin stainless finish appears cleaner, exhibits no finishing marks and its matte appearance looks clean even after shooting a lot of rounds. A final thought I have on the Model 66 is the black rubber grip. The rubber material is very tacky and gives you great dexterity when shooting .357 Magnum rounds. So all-in-all, the large grip accomplishes what it sets out to do which is give the user a sturdy purchase to control and accurately fire the revolver. 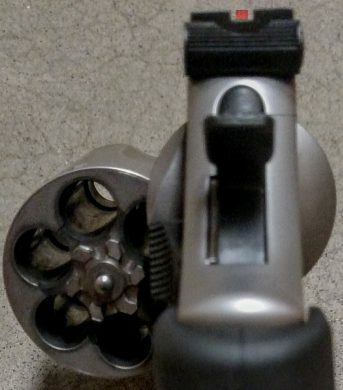 Since this is only a 2.75″ barrel, I would have liked to potentially see a little smaller grip even with all of those positive, previous comments. I would not put this specific variation of the Model 66 into the category of a range pistol even though it shot really well. Its outward appearance and likely intended purpose would be for carrying; whether that is concealed or open. So to have a shorter handle would benefit anyone trying to carry it. In summary, I believe the Smith & Wesson Model 66 Combat Magnum® .357 Magnum revolver is a well thought out pistol. The MSRP of $849 is still within a tolerable range for most people’s checkbooks and my few complaints about a possibly shorter handle and improved rear sight are more personal opinions than engineering flaws. If you are contemplating purchasing the Model 66, I can confidently say after spending significant time with one that you would not be disappointed.